Pershing Memorial Cemetery was originally named Limon Cemetery; the name was changed to honor William S. Pershing (1852-1942). He is referred to as the founder of Limon and became the town's firt mayor. To reach this cemetery from the town take Hwy. 71 north to 7th St.; turn left on 7th for a short distance.— Linda Wommack, From the Grave; a Roadside Guide to Colorado's Pioneer Cemeteries (Caxton Press, Caldwell, ID 1998), p. 65, 67. 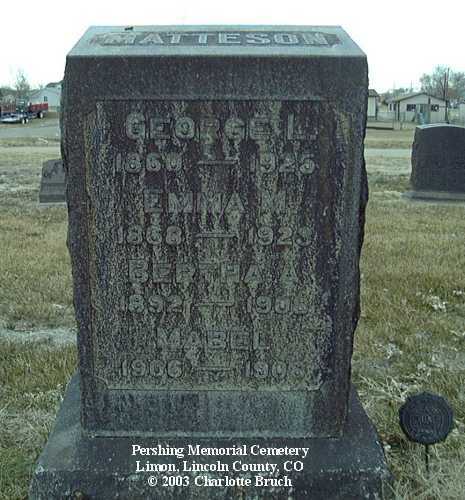 George and Emma Matteson are the parents of Bertha and Mabel.